Recipe 9: For the first dish of the year I wanted something great, a bit unusual, weird… In few word, something special and I remembered this recipe my mum prepared in one of the latest Christmas: Risotto with pomegranate! Ingredients for 6 people: 500 gr. of rice, 2 pomegranates, 1 onion, pepper, salt, a bit of butter and Parmesan, 250gr speck. Put some oil in a pan with the onion and let it cook until goldish. Take of the fruits from the pomegranate and leave them in a side. Then add the speak chopped in little cubes and let it cook. Add the rice, let it toast and add a glass of white wine. When evaporated add some vegetable sauce from the stock. When the rice is almost ready add the pomegranate’s fruits. When ready take the pan off the fire, add some black pepper, butter and grated Parmesan. Enjoy! PS. Piatto super lusso per l’inizio dell’anno. Ok il sapore e’ un po’ originale ma per i primi giorni dell’anno nuovo ci sta proprio bene!!!! Recipe 18: This dish it’s quite light and very balanced, perfect for every dinner during the week and very quick to do also for guests. It’s typical in the center of Italy and it’s also fresh and simple. Here the ingredients for 2 people: around 350gr of beef in a very thin cut (better if cut by the butcher or buy very thin steaks with less fat possible) a bag of rocket salad, oil, salt, pepper a bit of vinegar and Parmesan in slices! Just put some oil in a pan with 2-3 garlic cloves. Leave it cook and get goldish and then take them out! In the meantime cut all the fat from the thin steak and cut it in little rectangular pieces. Place them in the pan with some salt and let it cook. 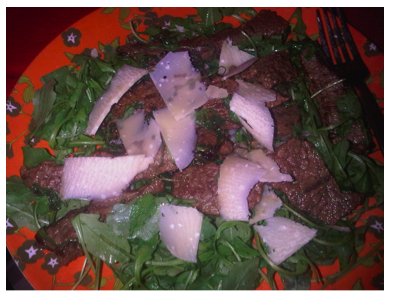 In a plate prepare a bed of rocket salad and mix it with some oil, balsamic vinagre and salt. When the meat is almost ready, put in the pan some rocket leaves to cook with the meat. When all is ready place the meat on the rocket bed and add lots of Parmesan in slices! Enjoy! PS. Mamy e da quanto tu non fai un bel piatto di straccetti? Io li ho trovati tra i nostri appunti e non ho potuto resistere… anche se magari sono meglio d’estate. 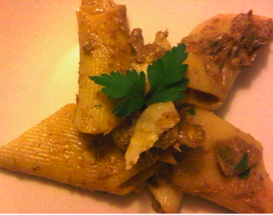 Ma sono cosi rapidi e genuini, con questi semplici prodotti, che m’e’ venuta fuori una cenetta infrasettimanale con i fiocchi!